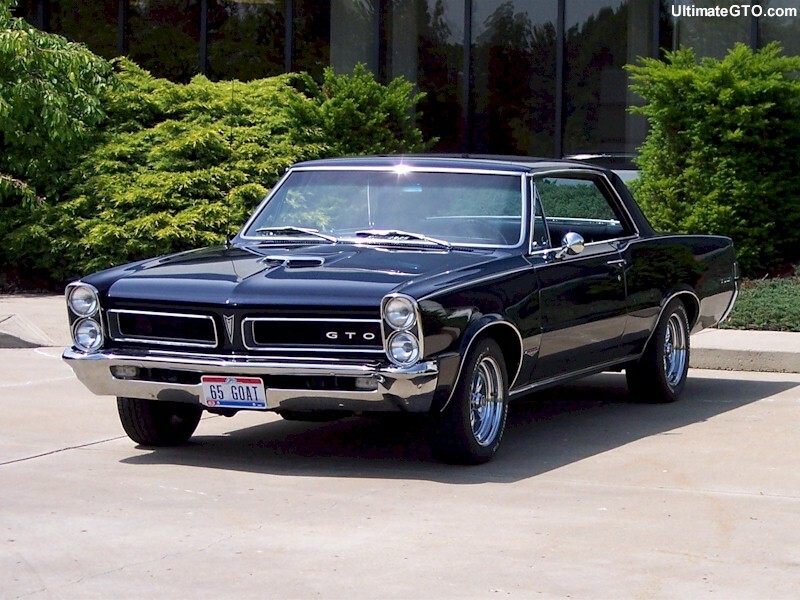 1965 Pontiac GTOs. Lot 56 of 85. CLICK-> Reef Turquoise 1965 GTO convertible, front end view. CLICK-> Reef Turquoise 1965 GTO convertible, right side vew. CLICK-> Reef Turquoise 1965 GTO convertible, rear end view. 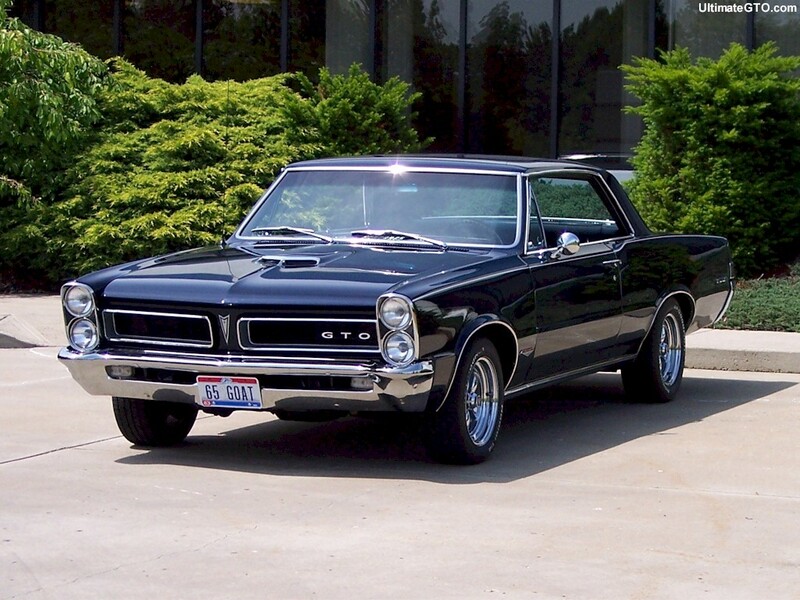 CLICK-> Nightwatch Blue 1965 GTO hardtop from Jason Lester from Loveland, Ohio. Jason had this to share, "It was originally a Tri-Power 4-speed car. When we got the car it had a 4-barrel on it. The original motor was gone but it has a Pontiac 428 in it. I converted it back to a Tri-Power. It has an M21 close ratio 4-speed with 3.90 gears in the rear. This car is very close to the one my Dad had when he was 17. We are currently looking for it and would love to know where it is. Any info is appreciated. It's VIN ended in 2162." How about a version for your desktop wallpaper; 800-600 wallpaper and 1024-768 wallpaper. CLICK-> Here is a shot of the Tri-Power equipped 428 under the hood. CLICK-> Montero Red 1965 GTO hardtop owned by Ron Buffa from Hinckley, Ohio. Ron tells us, "I found it on the internet in Missouri. I had it shipped to Ohio five years ago  and it took two and a half years to restore it. It is a rare factory air car, 389 tri-power, 4-speed. It has been restored to original specs." CLICK-> Montero Red 1965 GTO hardtop, interior view. The air conditioning controls in the dash are a bit different than other 65s with air. Take a look at another one. CLICK-> Montero Red 1965 GTO hardtop, trunk view. CLICK-> Montero Red 1965 GTO hardtop, right side engine view. CLICK-> Montero Red 1965 GTO hardtop, left side engine view. CLICK-> A peek at the oil pan on Ron's 1965 GTO hardtop. CLICK-> Burgundy 1965 GTO convertible owned by Bruce and Paula Cummins from Metropolis, Illinois. Bruce tells us, "I have owned it since 1982. My son and I completed the 1st (amateur) restoration in 1985, at which time, we painted it Red. Last year I decided it was worthy of a professional paint job and decided to change the color to Burgundy. The interior is pretty decent original but I have a new 'Legendary' interior to be installed in the winter [of 2006/2007]. It runs a stock 400 engine from a junkyard '69 Catalina, with an original 389 sitting in the garage to be installed at a later date. As far as I know, the 2-speed automatic has never been rebuilt and, other than a little leakage, still works fine." CLICK-> Burgundy 1965 GTO convertible, front end view. Cool background. It's an action photo. There's a train crossing and a barge barging! CLICK-> Burgundy 1965 GTO convertible in Metropolis, Illinois. This little guy wants a ride. The Metropolis Chamber of Commerce is promoting the city as the "Home of Superman". They have a yearly 4-day celebration for the flying superhero. The growing festival draws celebrity guests, has a costume contest and exhibits of Superman comic book artwork, etc. The focal point in the city is the Superman Statue - a 15 foot painted bronze likeness of the "Man of Steel". If you want to visit Metropolis, find the huge statue on the north side of the Massac County Courthouse overlooking the business district. CLICK-> Here is the left rear view of the convertible. In the background, you can see some old gas pumps. Says Thom Barker (SalineTB. @aol.com) - "Really enjoy visiting your site. It's so disapointing that I can't own every one of these specimens."